Nostalgia and taste buds unite! 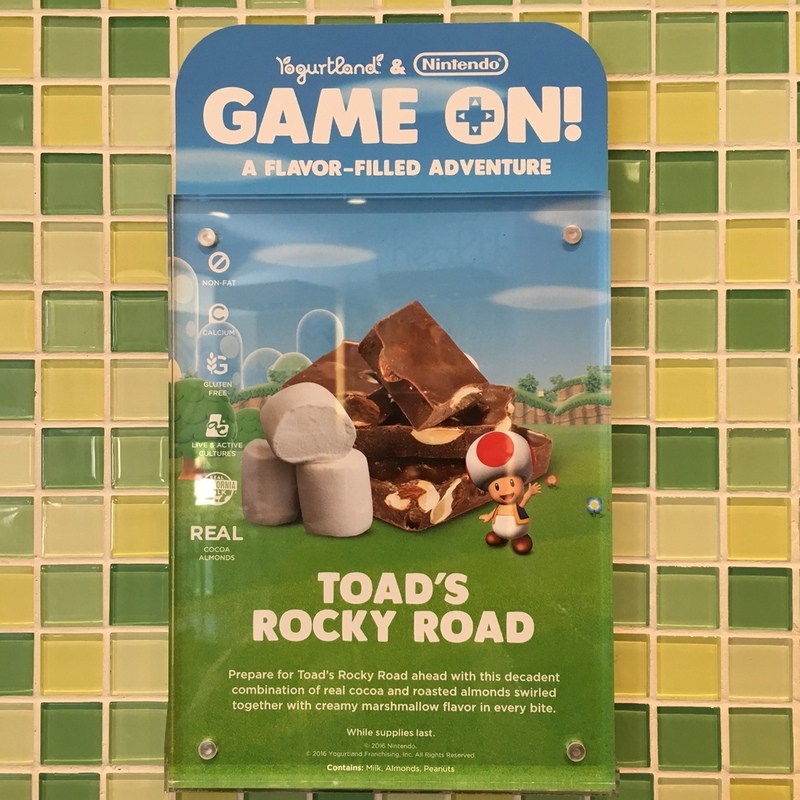 Nintendo partnered with Yogurtland this summer to release a Flavor-Filled Adventure line of flavors themed after our favorite Nintento characters. 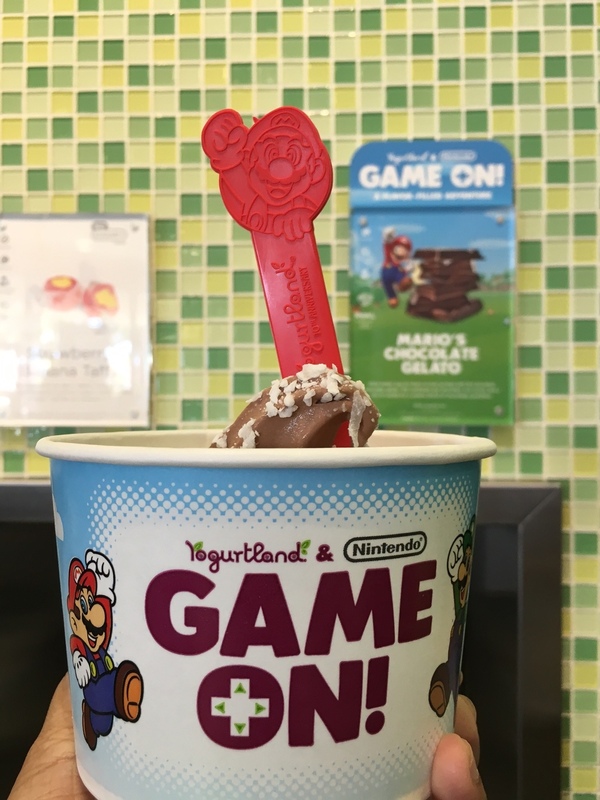 From July 1 to September 8, select Yogurtland locations will deck the walls & cups with Mario, Luigi, Princess Peach, Yoshi, and Bowser graphics. There are also 5 collectible biodegradable spoons that can only be found at Yogurtland locations that you'll totally want to grab. I was invited to the Flavor-Filled Adventure Blast Off party at the Westgate West Yogurtland location today to try some of the new flavors. I started with Yoshi's Honeydew, which I really didn't expect to like since I am not a huge honeydew melon fan. I was pleasantly surprised! The texture is rich and creamy - just a like a frozen yogurt should be. I think I expected it be a little more like a sorbet, but thankfully it wasn't. There was also no tangy flavor, just a nice sweet soft taste that was like an actual honeydew. I topped mine with Fruity Pebbles and coconut flakes for the mixture of crunch and tropical goodness. I would definitely eat that again. I skipped sampling Toad's Rocky Road because of my lame, newly discovered almond allergy, and instead went straight to Mario's Chocolate Gelato. Well, I later discovered that this flavor also contains almonds AND soy - both of which I am allergic to. I like that Yogurtland signage at the store and the nutritional info on the website is very open about what each yogurt contains. Since I wasn't paying attention, I had a taste of the chocolate and I actually really liked the flavor despite the fact that I never eat chocolate ice cream or yogurt and I never drink chocolate milk. I am just not a fan of cold chocolate in general. Mario's Chocolate Gelato has a very rich, smooth taste, which is what everyone loves. The hint of vanilla adds a subtle sweetness without being overpowering. I added coconut flake because I love chocolate and coconut so much. While I was licking my spoon and scrolling through my photos I noticed that the sign I snapped a photo of called out the almonds and soy so I stopped eating it right away. Here you can see how Yogurtland clearly states what is in each yogurt flavor under the flavor description. More flavors will be released throughout the summer - one every other week. I still need to try Bowser's Dragon Berry Tart which wasn't available at this store and I'm really looking forward to Koopa Troopa's Lemon Cupcake (8/19), Donkey Kong Banana Cream (8/5) and Shy Guy's Pineapple Lime Coconut Sorbet (8/12). To sweeten the deal for Nintendo fans, Yogurtland is also hosting a sweepstakes. By visiting https://www.yogurt-land.com/ you can enter to win a Wii U system and one year of free frozen yogurt. All participants have to do is visit the website starting on July 1 and follow the simple steps to enter. One grand prize package will be rewarded every week during the 10-week promotion. By entering the sweepstakes, you are also eligible for instant giveaways, including unlimited frozen yogurt cups, Wii U and Nintendo 3DS games, as well as shiny new Nintendo 3DS systems that come with one game. I'll be dropping in as the flavors are released over the summer to taste the treats and maybe even catch some Pokemon while catching all the spoons. Connect with Yogurtland on Facebook, Twitter, and Instagram, add them on Snapchat at @yogurtlandinc or visit them online at Yogurt-land.com.